Recently I finished reading the book Get in the Boat, by Pat Bodin. The point of this book is that technical people are not in the boat with corporate leaders, because they speak a different language and have different priorities and risks. However, the part of this book I found particularly enlightening was the treatment between technologists and IT. That hit me like a 2×4 square to the jaw. I got into this field 20+ years ago because coming out of college I saw with wonder the way Cisco Systems was connecting and changing the world. It was clear to me, even back in 1992, that people in the wake of Cisco Systems were the movers and shakers of the world, and only good things came from being associated with this company of strength. At that point in time central IT did not exist, not like today anyways, and central IT was being elevated — from a cost center to a strategic focus for the business. Very relevant. Somewhere along the way IT became a burden — divorced from the leading-edge technology that changes business for the better and gives each business who properly digests technology a competitive advantage against their peers and now married into a me-too table-stakes of basic uptime and SLA fulfillment. For example, I know a VP at a leading higher education institution who has a main job of approval of emails that have to go out campus wide. Think about that for a minute- when did IT go from creating a project where a person in London could color-match a car manufactured in Berlin to bureaucratic email approver? And this is a vice-president. Makes you wonder how relevant the lowlife IT individual contributor is to the president of the University? The book does a great job of understanding value-chaining: How can your actions at the Red level impact Blue, and impact Green. Don’t understand those colors? Read the book! It reinforces the basic message we already know inside – You are not relevant because of what you do, but because of how you affect other people. When you talk to green about “technologists” they equate that word with blue people – lines of business who practice “shadow IT”. When you talk to Red about “technologists”, they will think IT. Big mistake. Even the way we as IT talk about Blue people is in a way to delegitimize and dirty them (again, shadow IT). We have to be those Blue people, not bash them! For anyone who has read the Phoenix Project, this book is a great 2.0 read to that book. A lot of the principles and messaging connect. This is a fantastic read for anyone who works in my field of technology, especially those who work or sell into information technology. In my line of work (Higher Education) – we may have 5,000 full time equivalents in an organization. Of those, Id say Red is about 200 (IT people), Blue is 4,795 (faculty / staff) and Green is about 5 people. 5 People that’s all. A lot of titles like VP of applications may seem to the untrained eye to be Green, but they are blue. A teacher who is leading edge and consumes technology in her classroom in a way years ahead of her peers and gets better grades for students – Blue, not Red. I think of Red as lone-wolves in centralized IT. Period. 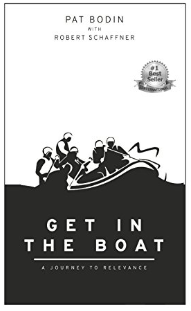 Get in the Boat is available on Amazon for $17.95.